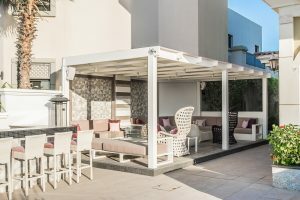 In pergola design plans, a pergola forms a shaded area, a passage, sitting areas, or a walkway on vertical posts, which support horizontal beams that can be accented with garden plants or with wood shades. Whether freestanding or built off an existing structure, pergolas provide an exceptional way to add structure, shape, function, and beauty to your yard. 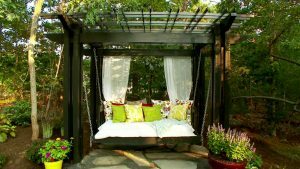 Additionally, these pergola design ideas offer helpful tips and tricks of the trade to enhance your outdoor space. When considering your pergola design, take a good look at your existing landscape design. Oftentimes, there’s a natural spot in your backyard for a pergola. However, don’t let your existing landscape elements deter you from adding a pergola to your yard. 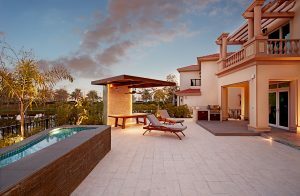 The flexibility of pergola design enables modifications to best fit your needs and requirements. For example, an existing tree provides natural shade. The versatility of pergola design allows for a pergola’s roof to be built around an existing tree (when necessary). Alternatively, if you’re short on square footage, you can build your pergola off of an existing structure. 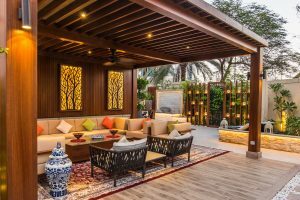 Some pergola designs inject both a decorative and functional design for your space. For example, when you build off of your existing villa, you can accentuate the architectural design elements of your home. 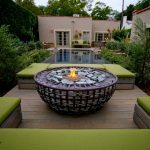 Consider adding textural materials on the exterior repeat of your pergola design to offers a welcoming, softening the transition between your villa and deck areas. You can also design your pergola transition between spaces in your landscape (i.e., between your pool area and outside living area, etc.). Pergolas are also a great way to ease the transition from your home to other hardscape amenities, such as a pool and outdoor kitchen. Depending on your space, you can set the pergola’s roof boards as needed to shield the sun. While a pergola can be designed to stand alone, it also works well with other outdoor structures, such as a deck or patio. Depending on where you place your pergola, it can also help designate the various zones in your yard, such as a seating area or walkway. Cramped for space? Not to worry. 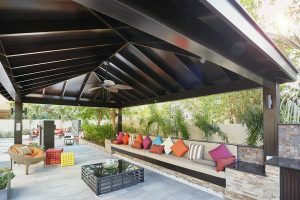 Even a small pergola design can help to accent a home’s patio, providing an intriguing backdrop, while creating the feeling of a separate space. Regardless of the size, a pergola is ideal for an outdoor seating area, dining area, or even by your pool. Pergolas are a natural fit and integrate well with other outdoor living amenities. 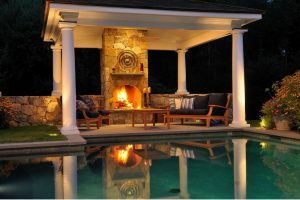 Depending on your pergola design, the large beams of can blend with the bulky structure of the stucco fireplace. A pergola is versatile. You can design your pergola in a range of structures. Whether you want to create a charming and cheerful seating structure, add a focal point to your garden, or draw attention to a specific area of your yard – the right pergola design will help! 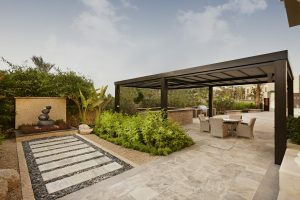 Although space and budget play a role in your pergola design, in general, the “rules” of pergola design are adaptable. For example, you can play with multiple heights in a pergola’s ceiling to add visual interest or add columns to create a more formal look. The choices are limitless! When designing a pergola, the possibilities are limited only by your imagination! Start today by contacting a member of the Milestone design to discuss your pergola design needs.